Go on an exhilarating hiking adventure in Bali when you join this sunrise trekking activity on Mount Batur! Nice experience, awesome guide who was really helpful and kind! More than we expected. Would do it again, because the view was incredible and worse it!!!! Bali’s beaches are not one to be missed! But once you’re done with your beach bumming and want something more adventurous why not join this trekking activity at Mount Batur? This active volcano is famous for being recognized by UNESCO as part of their Global Geopark Network and is a favorite hiking destination of both locals and tourists alike. After a couple of hours of trekking, you’ll enjoy a light breakfast prepared by your guide while you welcome the morning on the summit. 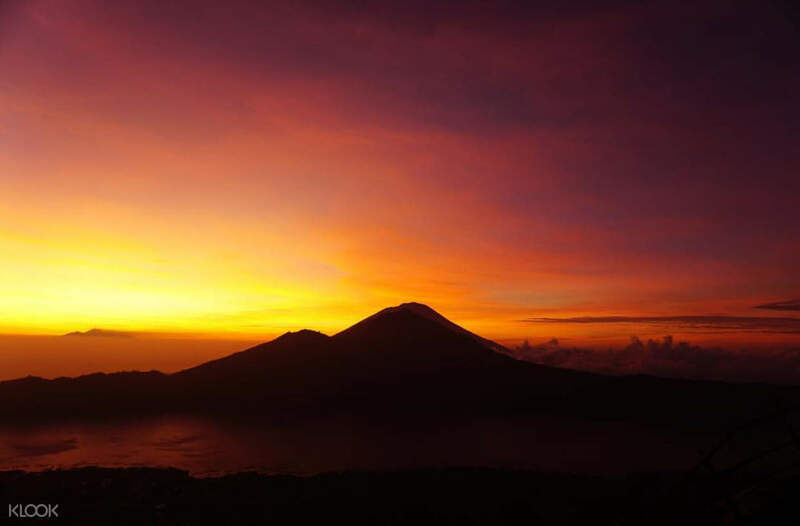 Be in awe as you witness the sunrise from the top of the volcano and see its flora and fauna illuminate during the golden hour! Aside from this exhilarating experience, you also have the option to take a dip into some natural hot springs after your trek or drop by the jungle swing! Whatever you choose, you’re sure to have an unforgettable time when you join this trekking adventure on Mount Batur. Welcome the morning atop an active volcano when you join this trekking experience of Mount Batur! You can choose to continue your exhilarating day on the jungle swing! Thanks to the good weather the trekking was so awesome and successful! Our tour guide-Tindih is very nice and take care of us throughout the trekking to the top. Our driver-Komang also very good and friendly! This combo trip is truely worth the price that you able to go different attraction and back to rest around afternoon. Thanks to the good weather the trekking was so awesome and successful! Our tour guide-Tindih is very nice and take care of us throughout the trekking to the top. Our driver-Komang also very good and friendly! This combo trip is truely worth the price that you able to go different attraction and back to rest around afternoon. Awesome and hassle free experience from hotel pickup to the end of the trip. You will have nothing to worry about. The driver and trek guide were both very helpful and pleasant to talk to. Beautiful hike and breathtaking view from the top. Watch out for monkeys. Our driver Jack, and trek guide Patrick... Both awesome. Thank you! 🙏. Awesome and hassle free experience from hotel pickup to the end of the trip. You will have nothing to worry about. The driver and trek guide were both very helpful and pleasant to talk to. Beautiful hike and breathtaking view from the top. Watch out for monkeys. Our driver Jack, and trek guide Patrick... Both awesome. Thank you! 🙏. Booked a private tour for 2. The driver picked us up punctually at 1:30am from our hotel in Seminyak. Reached the start of the hiking trail around 3:30am where we met our guide, and it took us about 2 hours to reach the peak. The hike was manageable, with the toughest parts being at the start (super steep slopes) and the last 10 minutes of the climb (rocky parts). In any case you feel too tired to continue, there’s always the option of taking a motorbike up to the highest rest stop (we asked out of curiousity and they quoted us 450K, but probably negotiable). Our guide, Ketut Bakat, made the experience an extremely pleasant one. I had to stop midway to vomit during the climb (we were going too fast at the start - so pls pace yourself!! ), and he immediately knew what to do, taking effort to ensure I was ok the entire way up and placing my safety first. We still managed to make it to the top before the sun was up. He prepared banana sandwiches, chocolates, hard boiled eggs and coffee for us at the peak, where we sat on benches and witnessed the sunrise :’) He was very fluent in English, so he was able to share with us interesting facts about the mountain, and why they had to pray to the temple before the climb. Highly recommended! Booked a private tour for 2. The driver picked us up punctually at 1:30am from our hotel in Seminyak. Reached the start of the hiking trail around 3:30am where we met our guide, and it took us about 2 hours to reach the peak. The hike was manageable, with the toughest parts being at the start (super steep slopes) and the last 10 minutes of the climb (rocky parts). In any case you feel too tired to continue, there’s always the option of taking a motorbike up to the highest rest stop (we asked out of curiousity and they quoted us 450K, but probably negotiable). Our guide, Ketut Bakat, made the experience an extremely pleasant one. I had to stop midway to vomit during the climb (we were going too fast at the start - so pls pace yourself!! ), and he immediately knew what to do, taking effort to ensure I was ok the entire way up and placing my safety first. We still managed to make it to the top before the sun was up. He prepared banana sandwiches, chocolates, hard boiled eggs and coffee for us at the peak, where we sat on benches and witnessed the sunrise :’) He was very fluent in English, so he was able to share with us interesting facts about the mountain, and why they had to pray to the temple before the climb. Highly recommended! Our driver messaged the night before our hike (6hours before) and was prompt in picking us up. The driver dropped us off at the starting point of the hike and there we met our hiking guide, Ketut Bakat. The guide was very friendly and spoke excellent english. He was also very funny and made the hike “tolerable”. He even gave me a quick massage when my leg started to cramp up. The hike itself was challenging for a myself, a first timer, but we managed to climb within 2+ hours and the sun rise was well worth it. I would highly recommend this activity to all and especially the first timers. After the hike we went to the coffee plantAtion for some free coffee tasting, with no obligation to buy their product (my friend and I did because it tasted so good) and after that we went to do our jungle swing which was one of the best experience I had. The view and experience was worth it. We were back at our villa by 12:30pm. Our driver messaged the night before our hike (6hours before) and was prompt in picking us up. The driver dropped us off at the starting point of the hike and there we met our hiking guide, Ketut Bakat. The guide was very friendly and spoke excellent english. He was also very funny and made the hike “tolerable”. He even gave me a quick massage when my leg started to cramp up. The hike itself was challenging for a myself, a first timer, but we managed to climb within 2+ hours and the sun rise was well worth it. I would highly recommend this activity to all and especially the first timers. After the hike we went to the coffee plantAtion for some free coffee tasting, with no obligation to buy their product (my friend and I did because it tasted so good) and after that we went to do our jungle swing which was one of the best experience I had. The view and experience was worth it. We were back at our villa by 12:30pm. 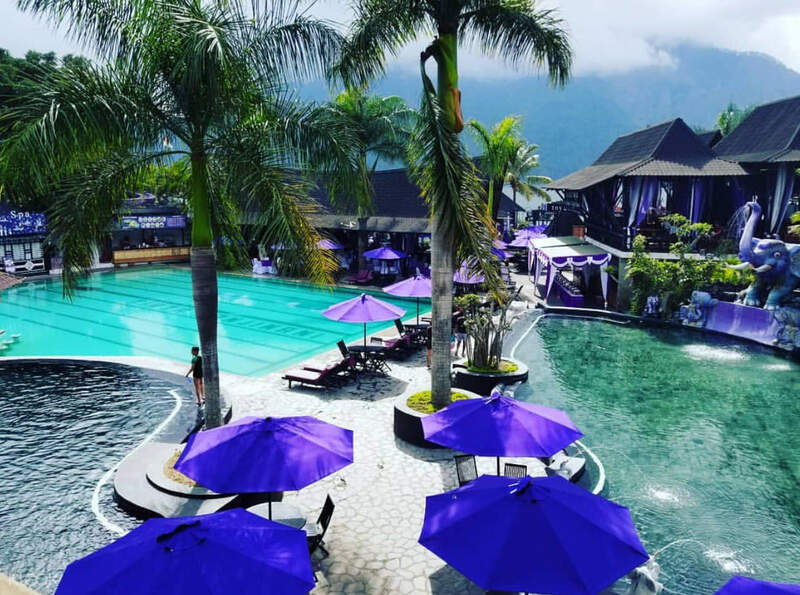 The travel to Mount Batur started well, our driver texted us the night before to confirm the timing and he was on time waiting at the lobby. He was always present at the car which was nice because we do not have to wait for him after each activity. Throughout the journey to our start in point we slept peacefully because the drive was pretty smooth and aircon was just nice. when we reach we were introduce to our guide and he was pretty knowledgeable, experienced,friendly and importantly he knows the danger and how to keep us safe. Told us the history and when there is a landmark he would stop and explain to us the meaning of it. He paced out the climb well too and honestly without his help I doubt we will reach the top and let us know which spot is the nicest for photo taking. Going down was relatively easy and quick we managed to reach in an hour compared to the two hours climbing up. After that we went for Luak coffer nothing spectacular because not a coffee person. our last activity was Whitewater rafting and the guide here is pretty funny and friendly. He did most of the work in controlling the raft and make the journey fun. overall I will say go for this and you will not regret, just remember to have plenty of rest and jacket for the climb because it can get pretty cold going up especially at the top. The travel to Mount Batur started well, our driver texted us the night before to confirm the timing and he was on time waiting at the lobby. He was always present at the car which was nice because we do not have to wait for him after each activity. Throughout the journey to our start in point we slept peacefully because the drive was pretty smooth and aircon was just nice. when we reach we were introduce to our guide and he was pretty knowledgeable, experienced,friendly and importantly he knows the danger and how to keep us safe. Told us the history and when there is a landmark he would stop and explain to us the meaning of it. He paced out the climb well too and honestly without his help I doubt we will reach the top and let us know which spot is the nicest for photo taking. Going down was relatively easy and quick we managed to reach in an hour compared to the two hours climbing up. After that we went for Luak coffer nothing spectacular because not a coffee person. our last activity was Whitewater rafting and the guide here is pretty funny and friendly. He did most of the work in controlling the raft and make the journey fun. overall I will say go for this and you will not regret, just remember to have plenty of rest and jacket for the climb because it can get pretty cold going up especially at the top. This trip us a must-do thing in Bali!!! Our guide, Mr Ketut bakat is friendly and experienced, the trip wouldn’t be that amazing without him!! He is also a very professional camera man~~ the trekking basically took 2 hrs going up to the top and another 2hrs down the hill with several stops along the way for a break (can buy supplements). Don’t worry too much about physical ability to hike, they have motorcycle taxi along the way to take you from the base to somewhere close to the viewpoint with additional charge of course. If you take the taxi, you just need another 20mins hile by yourself. 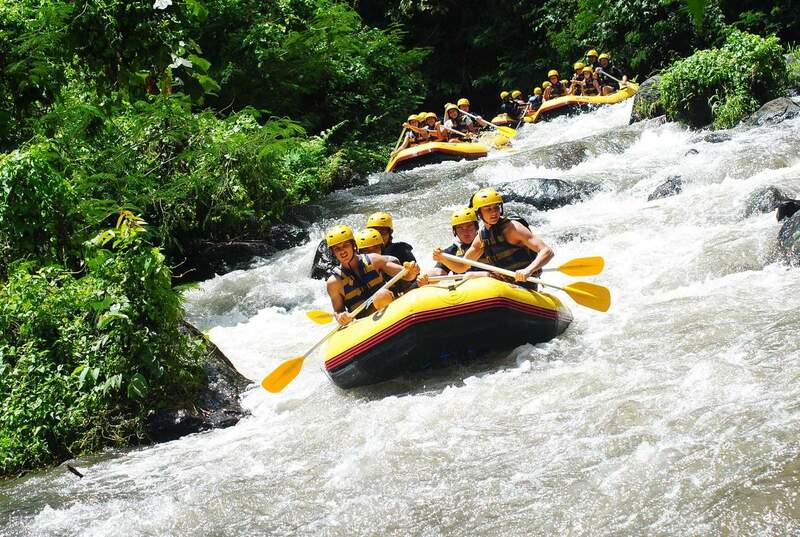 This trip us a must-do thing in Bali!!! Our guide, Mr Ketut bakat is friendly and experienced, the trip wouldn’t be that amazing without him!! He is also a very professional camera man~~ the trekking basically took 2 hrs going up to the top and another 2hrs down the hill with several stops along the way for a break (can buy supplements). Don’t worry too much about physical ability to hike, they have motorcycle taxi along the way to take you from the base to somewhere close to the viewpoint with additional charge of course. If you take the taxi, you just need another 20mins hile by yourself. Had a great morning doing the hike with Merta (my guide). He was courteous, and knowledgeable about the area and the surroundings. There are two trails to choose from, we did the harder trail which involves some scrambling but adds to the experience. The view from the top is breathtaking and definitely worthy of an IG post. 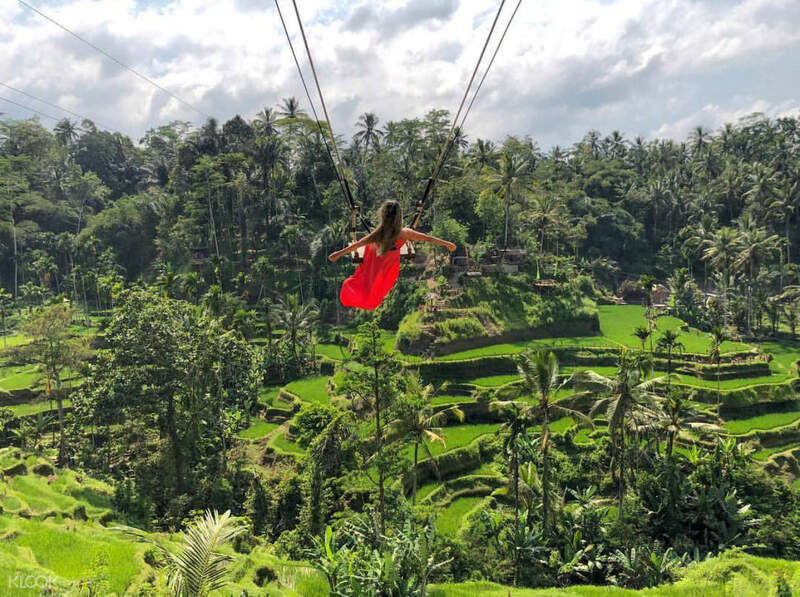 Would definitely recommend anyone visiting Bali to do it. Had a great morning doing the hike with Merta (my guide). He was courteous, and knowledgeable about the area and the surroundings. There are two trails to choose from, we did the harder trail which involves some scrambling but adds to the experience. The view from the top is breathtaking and definitely worthy of an IG post. Would definitely recommend anyone visiting Bali to do it. If we could give 10 stars for our experience, we totally would. We had the best trek guide, Ketut, and driver Jeru for our package. Ketut took very good care of us on our trek, made sure we got down the slippery slopes, and took awesome photos of me and my husband. For our coffee plantation and swing, we had the best time ever. Both Ketut and Jeru were very friendly and helpful, and despite not being able to speak English fluently we were able to talk and find out more about this beautiful country and its culture. We totally recommend this tour hands down. If we could give 10 stars for our experience, we totally would. We had the best trek guide, Ketut, and driver Jeru for our package. Ketut took very good care of us on our trek, made sure we got down the slippery slopes, and took awesome photos of me and my husband. For our coffee plantation and swing, we had the best time ever. Both Ketut and Jeru were very friendly and helpful, and despite not being able to speak English fluently we were able to talk and find out more about this beautiful country and its culture. We totally recommend this tour hands down. amazing view from the top of bali. the driver picked us up bang on time. the guide was amazing and guided us throughout. the hot springs were so relaxing after the trek. amazing view from the top of bali. the driver picked us up bang on time. the guide was amazing and guided us throughout. the hot springs were so relaxing after the trek. It was my first time trekking Mount Batur and I had no idea what to expect. Our driver Wayan was punctual to pick us up at 1.30am and we took a nap for about an hour ish before we reach the starting point of Mount Batur. It was drizzling when we got there, and we were immediately given free ponchos from our climb guide Ketut Bakat. He speaks good English, and was very helpful in managing our expectations during the climb. As it was my first time trekking, it wasn’t easy at all but Ketut will always ensure our safety, especially when the pathway gets steeper and rocky. He made us Banana sandwich and hot drinks when we finally reach the top at about 5.30am while waiting for the sunrise. Both my partner and I were impressed and thankful for Ketut’s professionalism, knowledge and sincerity as a guide. (On the sidenote, we even witness a lady who lost sight of her guide so we felt quite blessed we didn’t go through that). Ketut also helped us take many beautiful photos and videos! Even though the sunrise wasn’t the best due to the weather being cloudy, I still think the climb was worth it. I will definitely recommend Ketut to anyone who wish to trek Mount Batur! Big thanks to our driver Wayan too, for being so patient with us, helping us take photos and videos at the Jungle Swing and even accommodating to our request to stop by for lunch at Ubud area before driving us back to our villa in Seminyak. We had a really good experience overall! 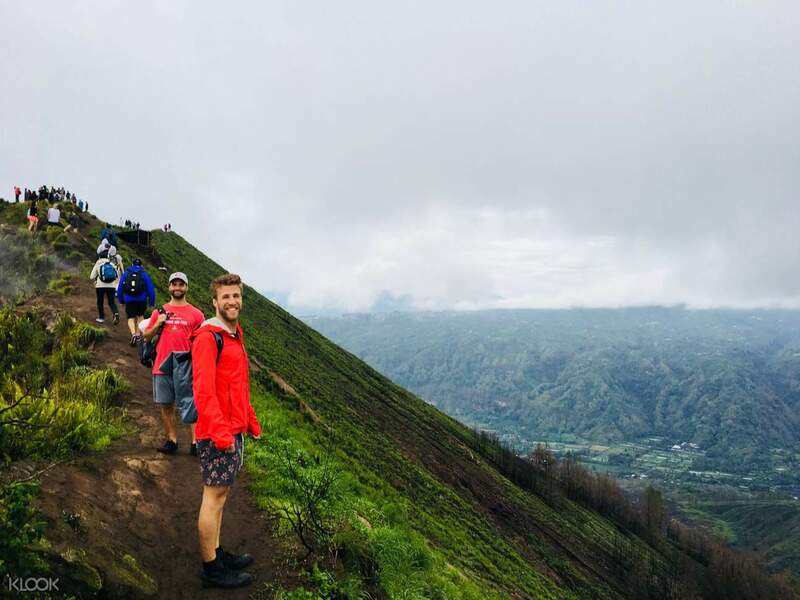 It was my first time trekking Mount Batur and I had no idea what to expect. Our driver Wayan was punctual to pick us up at 1.30am and we took a nap for about an hour ish before we reach the starting point of Mount Batur. It was drizzling when we got there, and we were immediately given free ponchos from our climb guide Ketut Bakat. He speaks good English, and was very helpful in managing our expectations during the climb. As it was my first time trekking, it wasn’t easy at all but Ketut will always ensure our safety, especially when the pathway gets steeper and rocky. He made us Banana sandwich and hot drinks when we finally reach the top at about 5.30am while waiting for the sunrise. Both my partner and I were impressed and thankful for Ketut’s professionalism, knowledge and sincerity as a guide. (On the sidenote, we even witness a lady who lost sight of her guide so we felt quite blessed we didn’t go through that). Ketut also helped us take many beautiful photos and videos! Even though the sunrise wasn’t the best due to the weather being cloudy, I still think the climb was worth it. I will definitely recommend Ketut to anyone who wish to trek Mount Batur! Big thanks to our driver Wayan too, for being so patient with us, helping us take photos and videos at the Jungle Swing and even accommodating to our request to stop by for lunch at Ubud area before driving us back to our villa in Seminyak. We had a really good experience overall!